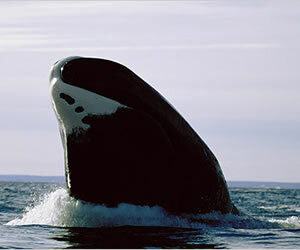 Bowhead whales received their name because of their high, arched lower jaw that looks like the archer's bow. They are dark black, brown or gray in color with white spots on their chin and belly. These giant whales use their large triangular shaped heads as a battering ram to break through 2 feet of ice to breathe. Bowhead whales are a member of the baleen whale family, having baleen plates instead of teeth. These baleen plates may reach up to 12 feet making them the largest of any whale species. They hold their mouth open as they swim through the water, letting the water flow through the baleen until krill, zooplankton and copepods (a group of small crustaceans) become trapped; then they close their mouth and swallow them. Because of their enormous size, they must eat up to two tons of food each day. 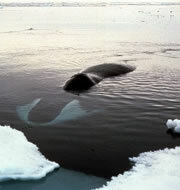 Bowhead whales live near pack ice, often in shallow water. Their two-foot layer of blubber protects them from the freezing waters. The southwest Bering Sea is their wintering grounds. In early April and all of May they swim past Saint Lawrence Island through the Chukchi Sea near Kivalina, Point Hope, Wainwright and Barrow Alaska. The migration patterns of the bowhead whale are still being studied. Beluga whales often swim with them as they migrate north to their summer feeding grounds. They quickly dive under the water when they are alarmed. These whales have excellent vision and hearing. They are rarely seen in pods and are usually alone. When they move south in the fall there may be as many as fifty whales swimming together. Killer whales may attack bowheads but humans are their main predator. The north pacific bowheads are now increasing in numbers, more than 8,000 animals. Whalers used to hunt them for their oil and baleen. These whales continue to be threatened by loss of food sources, climate changes, noise and pollution. Today, Eskimos hunt an allocated number of these whales each year for oil and food. Bowhead whales make sounds while moving under the ice, which are used to find their way around in the dark. They do not use sonar (echolocation) to find food but have been heard singing, calling back and forth to each other. The orca or killer whale is readily identified. With it's pointed dorsal fin of up to 6 feet tall and shinny black and white white bodies typically sporting a white patch behind the eyes. Length: 45-60 feet with a maximum length of 65 feet. Weight: 75-100 tons or 150,000 to 200,000 pounds. Travel speeds: up to 12 miles per hour with average speeds of 2-7 miles per hour. Typical submersion times: as long as 1 hour although most dives average 4-15 minutes. Conservation Status: U.S. protection under the Endangered Species Act and Marine Mammal Protection Act. International Whaling Commission outlawed whaling of bowheads in 1946.